Movement can be realised only and merely by the friction, but friction permanently causes different kinds of losses in motion – energy dissipation, mass loss, movement loss. Friction is therefore the process where positive and negative effects both manifest. In certain situations a large friction force is required, while in others a small friction force is needed. Because of that, understanding the tribological interactions between the shoe and the floor materials is important in order to enhance shoe and floor design, and to prevent slip and fall accidents during walking. Since the coefficient of friction measurements were commonly adopted to evaluate slip potentials, controversies have been found in the interpretation of measurement results. One study1 principally focused on broadening the knowledge base and developing new ideas on which improvements in the validity and reliability of slip resistance measurements might be made. To achieve this goal, crucial problems on the current concept of slip resistance measurement were extensively analysed from a tribological point of view, where the principle of understanding the shoe-floor friction and wear phenomena could be made. Based on this approach, new theoretical models were suggested in the paper1. This study discussed the limitations of present slip resistance measurements and analysed the seriousness of misinterpretations of slip resistance properties that were mainly caused by over simplified notions of friction phenomena between the shoe heels and floor surfaces. This resulted in a new paradigm of friction and wear phenomena between the shoes and floors. A computational model2 that was developed describes a mixed lubrication regime, simulating the hydrodynamic and contacting pressures at the shoe-floor-contaminant interface applied to pin-on-disk experiments. This research presents the first step towards developing a comprehensive shoe-floor-contaminant friction model, which will be useful for evaluating slip potential of shoes and flooring, designing safer shoes and floor surfaces, and understanding the biomechanics of slipping. On the basis of totality of the experimental and the simulation results as well as concepts, some recommendations for dealing with the tribology of polymer-based composites – in instruction as well as industrial and research settings – are made in the paper3. A review of standards and methods of slip resistance measuring provided by flooring and footwear suppliers in United Kingdom is presented in the paper6. It can be seen that a lot of suppliers didn’t specify data about the slip resistance of their products. The lack of international standards for the slip resistance of ceramic tiles is stated in the paper7. The paper considers recent and current potential developments in the international standardisation of slip resistance. It identifies some limitations of the wet barefoot ramp test, and suggests that changes should be made. The paper8 researches the friction between rubber and metal which can significantly influence damping characteristics of the rubber-metal springs. In the framework of the experimental research that has been conducted the coefficient of the static friction between the rubber and metal has been established in different contact conditions. Moreover, compressions of rubber-metal springs is also performed and force-deflection diagrams are recorded. In this way, the mutual influence of the static friction between the rubber and the metal pad and the accumulated/absorbed energy within a rubber-metal spring is analysed. Tribological approach of the contact footwear-floor is the subject of research that has started at the Faculty of Mechanical Engineering in Niš. Experimental research of static friction of footwear rubber samples and different types of floor materials is presented in this paper. In order to achieve vehicle wheel turning on the road, it is necessary to have the drive torque as well as a force of resistance in the wheel-road contact. Similarly, in order to make walking on the floor possible, a drive force delivered by the legs and a force of resistance in the footwear-floor contact are needed. This resistance is the static force of sliding friction. So, wheel rolling is achieved through the static friction force of sliding. Likewise, pedestrians can walk with the help of static friction force. Friction represents a resisting force that opposes relative motion of bodies’ surfaces that are in contact. According to the state of moving, i.e. to the resultant tangential force that induces moving, there are two types of friction. The static friction or the stationary state friction that exists when the resultant tangential force is lower than the summation of all resistances that oppose moving and the kinetic friction, or the moving state friction when the force that induces moving is greater than the summation of resistant forces. Under permanent conditions and even for the same material the coefficient of static friction value is not a constant and may vary in a certain range. The alteration of friction coefficient values is mostly stochastic, so one can only speak about the mean values of the friction coefficient. Friction coefficient values depend on different parameters such as the nature and properties of the used materials; contact pressure value; thickness and type of surface film; contact surfaces roughness; duration of the contact; chemical interaction; presence of external bodies in the contact area; cleanness of contact surfaces; temperature of the surrounding environment; relative humidity; or elasticity. Nearly 11,000 workers suffered a serious injury as a result of a slip in 2007 in Great Britain6. 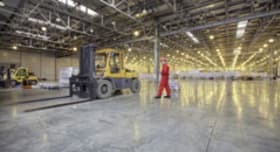 A key element of the HSE’s (Health and Safety Executive) work to reduce slips and trips is to raise awareness of how slip risks can be controlled through the use of suitable flooring and footwear. Research by the Health and Safety Laboratory has shown that a combination of factors contribute to slip accidents. There are the following influencing factors: floor, contamination, footwear, pedestrian factors, cleaning and environment. Footwear suppliers use a variety of terms to describe their products, such as ‘slip-resistant’, ‘anti-slip’, or ‘improving grip performance’. These terms can often mislead customers. Slip-resistant industrial footwear will normally have been tested according to European standards, but many manufacturers and suppliers do not give helpful additional information, such as the degree of slip resistance and the types of work environment for which their products are most suited. The aim of the HSE’s project6 was to collect and assess the slip safety information/literature provided by flooring and footwear suppliers in 2008 in Great Britain. A significant proportion of flooring products (55%) did not make any reference to slip resistance or provide any test data. No indication of slip resistance was given for 47% of footwear products. A review of flooring test data showed that 54% was generated using a pendulum test, 33% using a ramp test, 0.2% using roughness measurements and 12.8% was generated using sled-type test methods, which in the opinion of the HSE can provide misleading results in contaminated conditions. The type of tests used by footwear suppliers are the RAMP test, 46%, SATRA test, 40% and HSL RAMP test, 14%. The information provided by footwear and flooring manufacturers is not satisfactory. Many footwear manufacturers make vague claims suggesting slip resistance and do not provide supporting data. Many flooring manufacturers avoid making reference to slip resistance altogether and information is hard to find. The HSE suggests that many suppliers do not consider slip resistance to be a selling point and do not place significant emphasis on it. Currently, it is very difficult to make comparisons between products due to the number of tests used and specifications quoted. Where test data is provided, very little explanation is given and the layperson could be easily confused or misled. 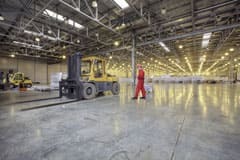 Footwear and flooring suppliers should be influenced to place more emphasis on the slip resistance of their products, and to use more standardised ways of assessing it. This would allow customers to make comparisons and help them to select the most appropriate product for their needs. Because of the complexity and factors involved, the measured coefficient of friction quantities shows inconsistencies even as the same shoe-floor combinations are employed. This fact has been recognised as a great concern when different friction testers, sensors and/or protocols are used worldwide. Variations of the coefficient of friction results under the same test environments have not received much attention in this research area. Despite this fact, most slip safety researches have reported that a particular shoe or floor surface resists the movement of a particular floor surface, or one’s shoe sole across its surface. Slip accidents can happen for a number of reasons: footwear, flooring, contamination and obstacles, cleaning, human factors, or the environment – but footwear and flooring are the most important for tribological research. Because of the existence of many different standards and methods for assessing slip resistance, measuring of friction coefficient on tribometer in laboratory conditions is very useful. Footwear is produced mostly from rubber, which is elastic, soundproof and has low gravity density and good tribological properties. Experimental determination of the static friction coefficient between samples of footwear soles and flooring were held at the Mechanical Faculty in Niš. Static friction force can be measured only in the moment of a slide beginning, because in next moment, after the slide starts, this values falls on friction kinetic force value. For floor samples (sample B) plates of laminate were used, rough ceramic tile and smooth ceramic tile. Dimensions of plates are 60mm x 75mm according the measuring device. Before testing, all contact surfaces were cleaned with acetone. Floor samples’ surface roughness was measured by a roughness measuring device. Our experiment showed that the values of the static friction coefficient were very unpredictable and random. The static friction coefficient of a leather sample with the presence of lubricants water and soap showed increases – the opposite to rubber samples with lubricants, where the coefficient of friction decreased. Very interesting results were found in the combination of rubber sample with relief and a smooth ceramic tile, where respectively measured static friction coefficient was very small – 0.25 in dry conditions, 0.11 when lubricated with soap. That can be explained by the small real contact area. Also, it can be conclude that for smooth ceramic tile the coefficient of static friction is smallest for each sample. Given the lack of static friction force in contact footwear-floor is often the reason for falls and injuries it is necessary to pay more attention to the tribological properties in footwear and floor production. Certain standards pertaining to slip resistance assessment are established in the EU. Up until now there hasn’t been enough professional interest in this area in Serbia, and it is left to the producers of footwear and floor. Because of the existence of many different standards and methods for assessing slip resistance, the measuring of the friction coefficient on a tribometer in laboratory conditions is very useful. Accordingly, the Faculty of Mechanical Engineering at Niš initiated research, aiming to determine the tribological properties rubber produces as footwear, acknowledging the importance of this problem and drawing upon its experience in earlier studies in the field of static friction. As a result, measurement of the static friction coefficient between footwear sole and floor samples was performed. For that purpose a measuring device was designed for static friction estimation and the measuring results showed that the static friction coefficient was stochastic and unpredictable. In further investigations it will be necessary to improve the measuring system and include more samples. Some samples should be industrial shoes and floors, tiles on public walkways, white stripes on pedestrian street crossings and other hazardous points where falls and accidents can happen.